USTA Junior Team Tennis coordinators and coaches are required register on Net Generation and complete USTA Safe Play background screening and the online USOC training course on a biennial basis. Coordinators and coaches who do not have current screening will not have access to TennisLink to create teams, register players, enter scores, etc. This is a very streamlined process and like with USTA membership, coordinators and coaches will receive a notice before their check expires. Click here to register on Net Generation. For 2019, the local participation fee is $22.00 per season. USTA Membership is required for all Divisions of Junior Team Tennis, and costs $20.00 per year. The USTA is currently offering a free first year USTA Membership for all children ages 10 and under. Click here for more information. Players in Championship Junior Team Tennis must remain age eligible through August 31 of the Championship year (in the year in which they are competing) to be eligible for advancement opportunities to the State, Sectional and National Championships. For the 2019 Spring Season, in the Championship program, players who age up to 13 on or before August 31 must play in the 14 & Under Division, players who age up to 15 on or before August 31 must play in the 18 & Under Division and players who age up to 19 on or before August 31 are not eligible. Otherwise, for the Junior Team Tennis program players should be age eligible through the duration of the season in which they are playing. Exceptions, for non-advancing teams only, due to limited team options at a given site, must be approved by the Program Coordinator or Division Commissioner. Players may not play up more than one age division. USTA Junior Team Tennis uses the NTRP system for rating players and determining the placement level. Players must be rated according to the NTRP Guidelines. It is the responsibility of the Team Manager/Team Coach/Site Coordinator to make sure all players are properly rated and placed based on skill level and age. The Junior National Tennis Rating Program (Junior NTRP) in TennisLink is the official system for determining play levels for USTA National Championships Junior Team Tennis. All 12 & Under, 14 & Under and 18 & Under players must be rated in accordance with the Junior NTRP in TennisLink to determine play level. Players with a rating of 3.5 and above must play in the Advanced Level. Players with a year end National ranking, must play in the advanced level. Players with a USTA Southern Standing of 1-100 in the 10's who are playing in the 10's must play Advanced. Standings are referring to results through July 31 of the previous Championship Year - 2017. Click here to search for USTA Southern 10&U standings as of July 31, 2017. If a 10 & Under player has a Junior NTRP rating of 3.5 or above the player must play Advanced. For players just moving up from 10 and Under Tennis or playing for the first time. Must be able to serve from the baseline and keep score with limited assistance. Must know how to play a tiebreaker with limited assistance. Must be familiar with court positioning for singles and doubles with limited assistance. Must be able to serve from the baseline and keep score without help. Must know how to play a tiebreaker. Must be familiar with court positioning for singles and doubles. Player must have, or be equivalent to a fairly high USTA State Ranking. For older players who are playing for the first time. This division is reserved for Advanced Tournament/High School team players. All questions regarding placement, especially exceptions to the stated criteria, should be directed to the Program Coordinator or Division Commissioner. Each team roster must be submitted with a minimum of 7 players, however, more are recommended. For the Spring Season, teams that wish to enter the Championship program must have a minimum of 3 boys and 3 girls, and are encouraged to have at least 4 boys and 4 girls. Please be advised that there are strict limitations regarding the number of players that can be added as subs for teams advancing to post season play! Information for subs is provided in the USTA Junior Team Tennis National Regulations and applies to all Championship play. Players may only participate on one Championship team during the local league season. The team entry deadline will be strictly enforced. Teams must have the required minimum number of players at the entry deadline. Prior to scheduling, teams that do not have the minimum number of players must be deleted. Team entries after the deadline and prior to the start of the season may be considered for a flight/division where there is a Bye, and only if the team has the required minimum number of players. Players may be added to a registered team after the initial team registration deadline. 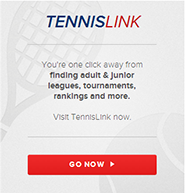 Players must be officially registered on Tennislink prior to participating in a match. Any player not listed on a roster in accordance with these rules shall be considered an ineligible player. All players must have credit for participating in two team matches during the regular season to be eligible for the local Playoffs or Championship play. If a player is scheduled to play and his/her opponent forfeits the match, that match will not count as a match played towards the two match history. COMMUNICATE, COMMUNICATE, COMMUNICATE! Home team coaches/managers must contact visiting Team Managers at least four days prior to the scheduled match to confirm location, time, etc. Everyone is encouraged to work out any time or line-up conflicts that may arise during the season. With the agreement of both captains, scheduled matches can be played earlier than the scheduled date. However, if a match is scheduled early, the Program Coordinator or Division Commissioner must be notified in order to make the match official. Team Managers must keep one another informed regarding the status of their line up. If for some unforeseen circumstance the home team is unable to provide it’s courts for any match at the scheduled time, the visiting team has first option of providing their home courts. If the visiting team does not elect to provide it’s home courts, the responsibility reverts to the home team to provide an alternate site, or teams may agree to adjust the start time or stagger matches. Team coaches/managers, or representatives must bring bring their line-up on the scoresheet to the match, and must exchange line-ups, simultaneously prior to starting play. Last minute substitutions may be made only in the event of illness, injury or absence of a player. Substitutions may not be made after a point has been played in that position. Scores of each match must be recorded and confirmed by representatives for both Teams. It is the responsibility of the home team to enter the scores online, within 48 hours - no later than 5:00 PM on Tuesday following Sunday matches. Scores that are not entered on time may be recorded as zero, one week following a verbal/written request issued by a Commissioner. Scores that are not entered on line within 48 hours following the last scheduled match of the season may be recorded as zero. All divisions will typically play a seven to nine week season, regardless of the number of teams in the flight. Except, flights in the Championship program will need to complete a round robin (or perhaps a double or triple round robin). The number of teams in each flight will determine the number of weeks unless otherwise specified. 12 & Under and 14 & Under Beginner and Intermediate Divisions: will play best of 3 - 4 game short sets with a match tiebreak in lieu of the third set. The set tiebreak is played at 3 all. 12 & Under Advanced, 14 & Under Advanced, 18 & Under Intermediate and Advanced: will all play best of 3 - 6 game sets with a match tiebreaker in lieu of a third set. The set tiebreak is played at 6 all. *A match tiebreak is the first to 10 points by a margin of 2 (rather than first to 7 for a set tiebreak). Team matches will consist of 3 singles matches and 1 doubles match. Players should be lined up based on their ability (i.e. strongest player at 1 singles and weakest player at 3 singles). Teams that play in the Championship Program must play 1 boy’s singles, 1 girl’s singles, 1 boy’s doubles and 1 girl’s doubles. Team winners will be determined by the team with the most individual match wins. Flight winners will be determined by the team with the greatest number of team matches won. If two or more teams are tied, the team with the most individual matches won (then most games won) will advance. In the event there is a tie in games won, the winner of head to head during the regular season will advance. Only the match results for players listed on the team’s roster will count towards standings. Technically, the match is forfeited when registered players are not available. However, Coaches are encouraged to promote play by finding a substitute to play the match against the opponent, when registered players are not available. Only subs that meet the criteria for age and skill level for a division/flight should be used. Players may not sub down. Each week the Commissioners will be reviewing the standings page and team match results to be sure that scores have been entered, and to monitor forfeits. Forfeits, especially those that have not been communicated in advance, are the greatest source of frustration among league players, parents and coaches. Please be sure to communicate with the opposing Site Coordinator as well as the Commissioners regarding forfeits – yours and your opponents. Excessive forfeits (above an average of 2 per team or over 5 per any one site) may result in site probation/suspension for the next season. Please be as lenient as possible, within reason, about defaults, such as for tardiness. It is the responsibility of the home team to provide a new can of balls for each individual match (four cans per team match). All match balls should be returned to the home team coach/manager, or representative. Low Compression balls are required for the following divisions: red for all 8 & Under; orange for 10 & Under Beginner and Intermediate; and green dot for 10 & Under Advanced and 12 & Under Beginner and Intermediate. Warm up is limited to 10 minutes, including practice serves. Coaching is not permitted for any division or flight, except "assistance" is required in the 10 and Under Divisions and allowed in the 12 & Under Beginner Division. Managers, teammates, spectators or Coaches may not volunteer advice on line calls or scoring. Excessive cheering or clapping is not permitted. It is the responsibility of both teams’ Managers, or representatives, to work together to control the conduct of the spectators during the match. The weekly practice component is very important in the USTA Junior Team Tennis program. Learning opportunities will surely be identified, by coaches/parents, during team match play. Organized practices are a fun time for players to get together with their teammates for instruction and play. The home team is responsible for providing water. It is optional for the home team to furnish additional refreshments. This is a common practice for other team sports and a great idea for parents to coordinate, especially in the younger age divisions. At the conclusion of the season, awards will be given to the players on teams winning their Division/Flight. A decision to cancel or play matches due to inclement weather must be announced by 11:00 AM. It is up to each individual site to communicate with the opposing team contact and to have a system to inform their players. In the event of rain, incomplete individual matches will stand as played. The same players at the exact game and point must resume incomplete matches as they stood when play was halted. Players will have ten days to make up their match. If no day can be agreed upon, the match must be played on the 11th day. If it rains on the 11th day, the match must be made up the next day there is no rain. (Incomplete matches (not retired matches) not made up by the end of the season will counted as a forfeit for both teams and players will not receive credit for a match played.) The first point in a match signifies the start of that match and sets the match. The existing line-up and forfeits stand. In the event a match is canceled due to rain, teams must follow the same procedure. However, in this situation, individual matches that had been forfeited in advance may be reinstated. Also, there is a built in rain date at the end of the regular season for the first rained out match. Any player who has been suspended from USTA competition will be suspended from any local or Championship Junior Team Tennis play falling during the suspension period.